Your Low-Residency MFA Guide: Converse! Back to school time already…which reminds me that the application deadline for the low-residency MFA program at Converse College, where I SOOOOO HAPPILY teach, is fast approaching: October 1. Are you nervous about being a student, for any reason? These pieces by two of our first semester students, Frances Neville and Edmund Schubert, will help allay your concerns. Do you still have concerns? Here’s where to find answers and where to direct any and all questions. Scroll down to the bottom for “contact us” and find Sarah Gray, Associate Director. Are you ready to apply? GO HERE! Hope to see you in South Carolina in January!!!!!!!!! Fall for the Book’s 19th annual festival will run from October 11-14 at George Mason University and locations around Northern Virginia. National Book Award and Pulitzer Prize-winning novelist Colson Whitehead, author of The Underground Railroad, will kick off the festival on October 11 at 7:30 p.m. in Harris Theater on Mason’s Fairfax campus. Also reading in Harris Theater will be Mohsin Hamid, author of the New York Times bestselling novels Exit West and The Reluctant Fundamentalist on Friday, October 13 at 7:30 p.m., and Lev Grossman, author of The Magicians trilogy—now a hit show on the Syfy channel—on Saturday, October 14 at 5 p.m. to close out the festival. Other major writers will include poet Ellen Bryant Voigt, author of Headwaters, nonfiction writer David Shields, author of Other People, novelist Karan Mahajan, author of The Association of Small Bombs, and poet Tarfia Faizullah, author of Seam. The festival will also welcome a robust list of poets, historians, novelists, memoirists, children’s authors, YA writers, cookbook authors and more. For the first time, Fall for the Book is partnering with the City of Fairfax’s Fall Festival on Saturday, October 14, to bring a day of literary and artistic events to audiences from throughout the region. For a full list of authors, visit www.fallforthebook.org or download our free app from your app store. Looking up something for something, I came across this list of quotations about writing short stories, and they are so brilliant and so inspiring, that I absolutely had to drop the something I’m working on and share these IMMEDIATELY. I suggest that you drop everything and read them right now! Social media can be so helpful to writers, offering ways to connect with other writers, bringing in fresh audiences for their work, and generally, helping with the business side of writing. Andi Cumbo-Floyd lives in rural Virginia working as a writer, editor, and teacher, and a farmer. She uses various social media to create a supportive online writing community, promote her writing, expand her editorial / critique business, and advertise her onsite writing retreats on her farm. When my clients ask how to use social media effectively, I always say: create conversations and build a community. Sounds simple, but many organizations fail to do this well. Andi, on the other hand, does a seemingly effortless job of making social media warm, inviting, and supportive. I’m a member of her online writing group and although we converse through computers, tablets, and phones, Andi creates such a heartfelt community that it feels like we’re meeting over coffee and chatting about our work. How does she do it? Andi was kind enough to discuss social media with me and answer my many questions. Carollyne: Which social media are you active on? Andi: I am active on Facebook with my personal page and three business pages, once for each my websites—Andilit, God’s Whisper Farm, and Our Folks’ Tales. Plus, of course, the writing community. I also have a Twitter page that I use less robustly but do share regularly there and retweet. I also post photos from the farm and often of books I’m reading over at Instagram. I’ve set up profiles on most social media sites, on the advice of Jane Friedman who recommends a presence everywhere even if you don’t use the medium particularly, but these are the ones I use most. Carollyne: How do you use the different social media and for what purposes? Andi: I’m not super great about dividing myself into categories, so I don’t have very solid guidelines for what I share where, which some people advise against. I, however, like to be my integrated self as much as possible. I only post about writing, or farming, or African American history and genealogy on my respective FB pages, and Instagram is mostly farm photos and bookish photos. On Twitter, I do tend to do more about racism and history there, but not exclusively. So, I have leanings in certain ways, but ultimately, my goal is to be myself everywhere. In terms of purpose, I pretty much hope to connect with people in a genuine, engaged way everywhere. I love people—introvert though I am—so I love meeting them and finding ways that our lives speak into each other. C: In what ways is social media helping your writing and your business as a writing consultant, editor, and teacher? A: Honestly, social media is at the heart of my business. I get clients through the groups I organize. I meet other writers and build strong relationships that often lead to business through social media. I’ve hired others I’ve met through social media. It’s a fundamental part of how I do my work. . . but that’s been a long time coming. It’s taken years of being available online, of being intentional about cultivating true relationships with people, relationships that are not driven by a “I hope they will hire me” mentality. I find that kind of thinking to be really gross, honestly. Rather, I’d rather be myself, get to know people, make what I do known, and let people find me for the work if they think I’d be a good fit for what they need. C: You’re an independent author. How do you use social media to promote and sell your books? A: I typically set up launch teams for my books and use social media both to communicate with them AND to promote the book through them. I share new covers or interviews I do about my books, and when they are forthcoming, I use memes and all the standard things to promote. I have tried sharing reviews as a way to bump up sales and get more reviews, but I don’t do that much anymore. Honestly, after the initial push when a book comes out, I mostly don’t promote it much directly on social media. It feels disingenuous to me to do that, and I also know that social media isn’t the greatest venue for book sales. That said, I’m also not shy about sharing what I write. . . after all, if I didn’t want people to read it, then why bother publishing. C: What advice would you have for other writers using social media? A: Be consistent and be genuine. If you post regularly, people will look for what you share. But you also can’t just throw things into the void and then disengage. You have to really respond to people – every comment if at all possible in as genuine a way as possible. And then, just be yourself. Share what you love (and a little, tiny bit of what you hate on occasion.) Be honest. Be open. And be wise – make intentional choices about what you share and where you share it. C: I’m a member of your wonderful online writers’ group. Why did you establish the group? A: I started it because I heard so many writers saying they didn’t know how to connect to other writers, and I’d felt that way myself. I wanted to create a place where writers could make friendships and business relationships with other people in the field. At first it was a pay-per-month deal, but a few months after it began, I decided to make it free because I enjoyed it so much. There are paid components – critique, workshop groups – but the heart of the group is free to any writer who wants to join, and I love that. C: Your writers’ community is so warm and supportive, which is difficult to do with an online group. How do you create such an atmosphere? A: Oh, thanks for those kind words. I’m not sure how that happened – I think it’s partially the nature of the people in the group, partially the fact that I try to be very present there, and partially the fact that I don’t tolerate any disrespect or ugliness in the group. . . or really anywhere in my online spaces. For me, every interaction I have with a person – on my good days – is about honoring the person on the other end – be that in person or through a screen – and I hope that comes through in the community. C: We all learn from failures. Are there any activities connected to your writing work that you tried on social media that were not successful? A: Yeah, for a while I was trying to post several times a day in all the places that I am via social media, and honestly, it was exhausting and felt very forced. I was using a scheduler and just pushing out content, and I was drained by it every day. So I stopped and found that I could be present every day if I just set out to do that, and that I could share more honestly if I shared when I felt I had something worthwhile to share. C: Social media can be quite a time sink, especially for writers. Do you have a schedule when you’re active on social media or another way to limit your social media time? A: Oh glory, I wish I did have a schedule because it is a time-sink. I’m honestly online most of every work day. It’s not the ideal. But I find that if I get my posting done or scheduled in the morning then I’m mostly checking in and responding to folks throughout the day, which I do enjoy and find important to build real relationships online. In the evenings, I sometimes get up images, which works well since lots of folks are online after their day jobs. But by then, I’m pretty much hands-off on the computer or phone. Andi Cumbo-Floyd is a writer, editor, and farmer who lives at the edge of the Blue Ridge Mountains with her husband, 38 chickens, 6 goats, 4 dogs, 4 cats, and 3 rabbits. Her books include The Slaves Have Names and Discover Your Writing Self. She writes regularly at andilit.com, godswhisperfarm.com, and ourfolkstales.com. Carollyne Hutter, www.HutterWriter.com, regularly writes on environmental, international development, and scientific topics for both adults and children. 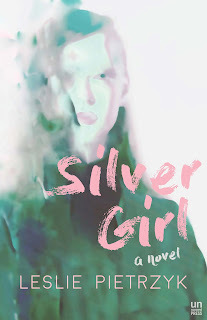 Here's the new cover for SILVER GIRL, which will be out in February 2018. I am THRILLED!